An ASI is a differential pressure gauge that measures the dynamic pressure of the air through which the aircraft is flying. Dynamic pressure is the difference in the ambient static air pressure and the total, or ram, pressure caused by the motion of the aircraft through the air. These two pressures are taken from the pitot-static system. The mechanism of the ASI in Figure 5-11 consists of a thin, corrugated phosphor bronze aneroid, or diaphragm, that receives its pressure from the pitot tube. The instrument case is sealed and connected to the static ports. 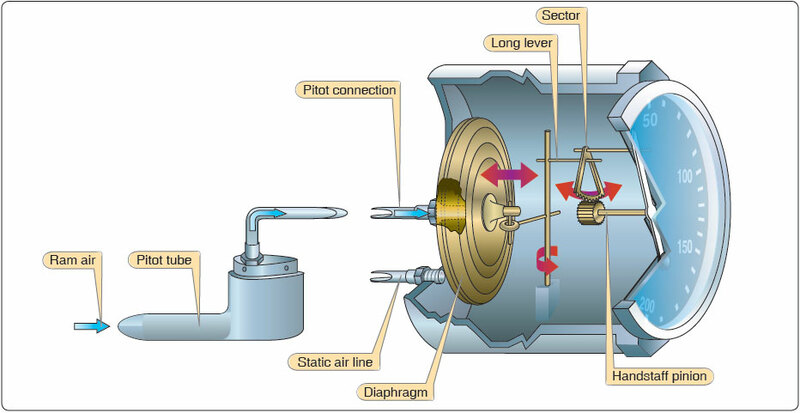 As the pitot pressure increases or the static pressure decreases, the diaphragm expands. This dimensional change is measured by a rocking shaft and a set of gears that drives a pointer across the instrument dial. Most ASIs are calibrated in knots, or nautical miles per hour; some instruments show statute miles per hour, and some instruments show both. 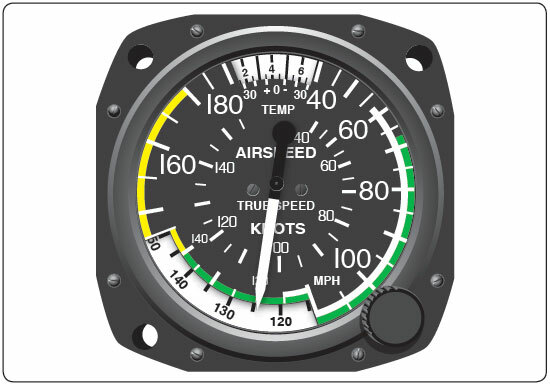 Just as there are several types of altitude, there are multiple types of airspeed: indicated airspeed (IAS), calibrated airspeed (CAS), equivalent airspeed (EAS), and true airspeed (TAS). IAS is shown on the dial of the instrument, uncorrected for instrument or system errors. CAS is the speed at which the aircraft is moving through the air, which is found by correcting IAS for instrument and position errors. The POH/AFM has a chart or graph to correct IAS for these errors and provide the correct CAS for the various flap and landing gear configurations. EAS is CAS corrected for compression of the air inside the pitot tube. EAS is the same as CAS in standard atmosphere at sea level. As the airspeed and pressure altitude increase, the CAS becomes higher than it should be, and a correction for compression must be subtracted from the CAS. TAS is CAS corrected for nonstandard pressure and temperature. TAS and CAS are the same in standard atmosphere at sea level. Under nonstandard conditions, TAS is found by applying a correction for pressure altitude and temperature to the CAS. Some aircraft are equipped with true ASIs that have a temperature-compensated aneroid bellows inside the instrument case. This bellows modifies the movement of the rocking shaft inside the instrument case so the pointer shows the actual TAS. Figure 5-12. A true ASI allows the pilot to correct IAS for nonstandard temperature and pressure. As an aircraft approaches the speed of sound, the air flowing over certain areas of its surface speeds up until it reaches the speed of sound, and shock waves form. The IAS at which these conditions occur changes with temperature. Therefore, in this case, airspeed is not entirely adequate to warn the pilot of the impending problems. Mach number is more useful. Mach number is the ratio of the TAS of the aircraft to the speed of sound in the same atmospheric conditions. An aircraft flying at the speed of sound is flying at Mach 1.0. 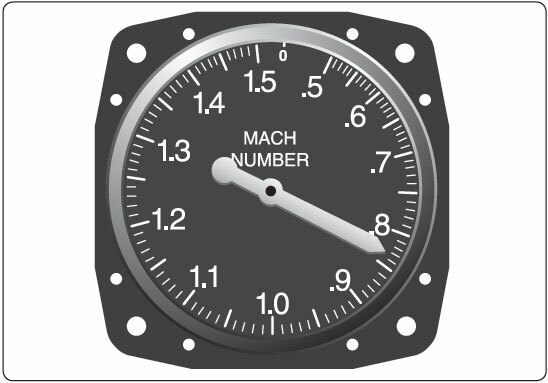 Some older mechanical Machmeters not driven from an air data computer use an altitude aneroid inside the instrument that converts pitot-static pressure into Mach number. These systems assume that the temperature at any altitude is standard; therefore, the indicated Mach number is inaccurate whenever the temperature deviates from standard. These systems are called indicated Machmeters. Modern electronic Machmeters use information from an air data computer system to correct for temperature errors. These systems display true Mach number. Most high-speed aircraft are limited to a maximum Mach number at which they can fly. This is shown on a Machmeter as a decimal fraction. [Figure 5-13] For example, if the Machmeter indicates .83 and the aircraft is flying at 30,000 feet where the speed of sound under standard conditions is 589.5 knots, the airspeed is 489.3 knots. The speed of sound varies with the air temperature. If the aircraft were flying at Mach .83 at 10,000 feet where the air is much warmer, its airspeed would be 530 knots. Figure 5-13. A Machmeter shows the ratio of the speed of sound to the TAS the aircraft is flying. Some aircraft that fly at high subsonic speeds are equipped with maximum allowable ASIs like the one in Figure 5-14. This instrument looks much like a standard ASI, calibrated in knots, but has an additional pointer colored red, checkered, or striped. The maximum airspeed pointer is actuated by an aneroid, or altimeter mechanism, that moves it to a lower value as air density decreases. By keeping the airspeed pointer at a lower value than the maximum pointer, the pilot avoids the onset of transonic shock waves. Figure 5-14. A maximum allowable ASI has a movable pointer that indicates the never-exceed speed, which changes with altitude to avoid the onset of transonic shock waves. 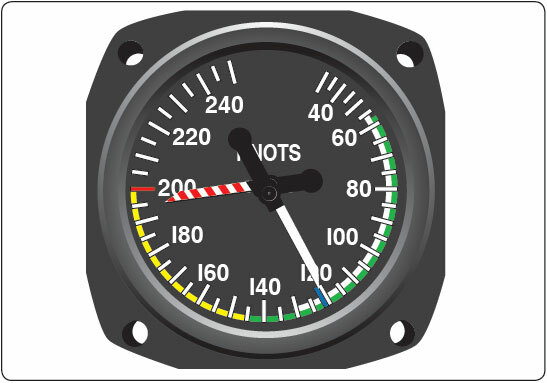 The dial of an ASI is color coded to alert the pilot, at a glance, of the significance of the speed at which the aircraft is flying. These colors and their associated airspeeds are shown in Figure 5-15. Figure 5-15. Color codes for an ASI.